Shijéí/My Heart is a brand new series of mixed media works by Carolyn Lee Anderson, a Minnesota-based artist of Navajo descent. This new series is inspired by the stories and artistic traditions of her family. 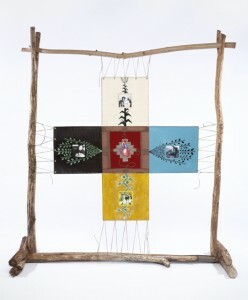 Acrylic paintings on canvas, patterned fabric, and Navajo weaving are stitched together and lashed to loom-inspired frames. Each material has its own history, and each art form is tied to her maternal lineage. By combining them, Carolyn acknowledges and examines these various historical threads and how they have affected and influenced her life. Carolyn Lee Anderson, in partnership with the Native American Community Development Institute, is a fiscal year 2011 recipient of a Cultural Community Partnership grant from the Minnesota State Arts Board. This activity is made possible in part by a grant form the Minnesota State Arts Board, through and appropriation by the Minnesota State Legislature and by a grant form the National Endowment for the Arts. This exhibit was also made possible with support from National Native Creative Development Program-Longhouse at the Evergreen State College.